Serene, sand-strewn shorelines, the rustling of palm fronds in the sea breeze and the gentle lull of the tide; it’s time to leave your worries behind and relax in the tranquil tropics. As you head North from Mackay, a world of adventure awaits. 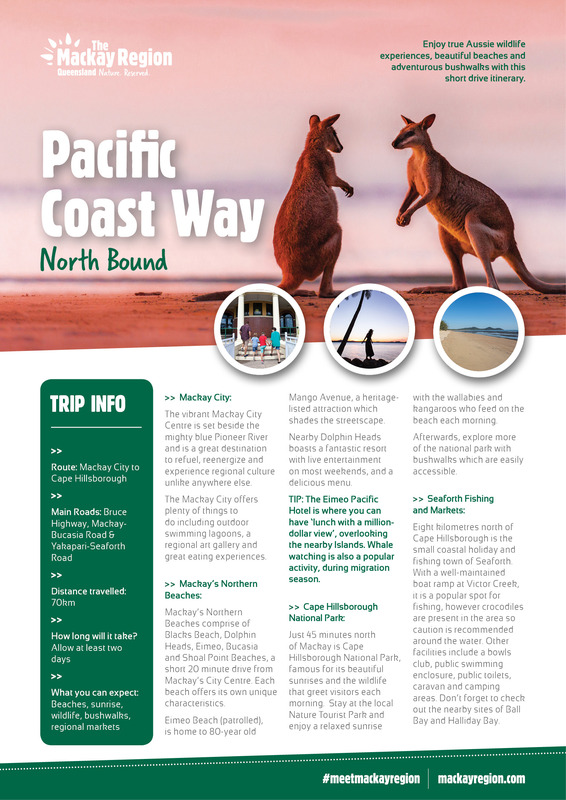 Visit the distinctively different communities in the Northern Beaches, then continue your journey to the captivating Cape Hillsborough. Cape Hillsborough Beach provides one of the most iconic Australian photo backdrops, the famous “Roo on the beach.” Enjoy this unique phenomenon as the morning sky is ablaze in spectacular shades of magenta as wild marsupials bound up and down the beach. Begin your adventure with exploration and breakfast in the vibrant city of Mackay. Beside the blue Pioneer River, Mackay is a great destination to refuel and experience regional culture before your journey. A 20 minute drive from Mackay's city centre, each community in the Northern Beaches area is distinctively different. Dolphin Heads boasts a fantastic resort with ocean views and a poolside restaurant. Eimeo Beach is a popular destination for swimming and is patrolled during the summer months and school holidays. It is home to the heritage-listed Mango Avenue. TIP: Enjoy lunch with a 'million dollar view' at the Eimeo Pacific Hotel. Drive: Mackay to Cape Hillsborough. TIP: Stop at The Leap to browse gemstones and learn about the history of Kowaha at the Leap Hotel. Keep an eye out for fresh fruit stalls along your journey, then stop at the Old Station Tea House for tea and scones. Settle in for the evening at the Nature Tourist Park at Cape Hillsborough and enjoy the serenity. Sunrise with wallabies: Wake early to enjoy a spectacular sunrise on the beach. Watch as kangaroos and wallabies fossick through the tide for their morning breakfast and capture an iconic Australian photograph. Explore Cape Hillsborough through a number of easily-accessible walking tracks. The trail from Casuarina Beach to Beach Comber Cove is a must-do for butterfly lovers, in fact, there are approximately 25 species of butterflies within Cape Hillsborough National Park. The Andrew’s Point walking trail provides breathtaking views and is a great vantage point to see turtles feeding on the grass beds. Starting from Hidden Valley, the Yuibera Plants walking trail shows how the original inhabitants of the area gathered food within Cape Hillsborough. Drive to Seaforth: Continue your journey North to explore the coastal villages of Seaforth, Ball Bay and Halliday Bay. A boat ramp at Victor Creek provides an ideal launch location for fishing and exploration of nearby islands. Crocodiles do inhabit the area so caution is advised. Ball Bay is a popular location for swimming and beachside barbecues.